Wine Wear, Inc. is a wine accessories company that specializes in greeting cards tailored to fit a wine bottle, decals to decorate wine glasses and custom outfits for wine bottles. Here at Wine Wear we are revolutionizing the way wine is gifted and enjoyed with our Wine bottle Wear, Wine glass Wear and Wine fashion Wear products. Wine bottle Wear – The patented greeting card for gifting wine. Simply write a personal greeting on the back of the Wine Wear card, slide it over the neck of the bottle and instantly have a unique gift. Wine glass Wear – Non adhesive, reusable decals for wine glasses that provide a unique way to identify and decorate your wine glass. It’s a must have accessory for any event. Just place the Wine Wear on your glass and peal it off when done. Dishwasher safe as well. Wine fashion Wear – Don’t let your bottles go naked. 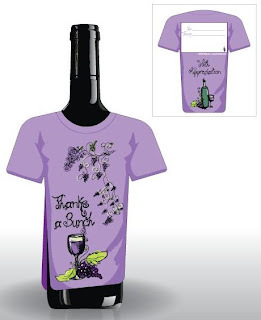 Dress them up for any occasion with our fun and festive clothing line for wine bottles. Our wine outfits make a great gift and decoration. Use Wine Wear Products for any event, holiday, occasion or just for fun! Check us out on Twitter and on Facebook. The item that I received for review was the Wine Bottle Wear "Thanks a Bunch". It looks cuter then I expected. It's nice to decorate a wine bottle when visiting someone's house for occations. It's unique, and nice to know that you won't get it back like a gift bag! Hi Found you on the blog hop, I just l;ove the title of your blog! Im you newsest follower. Thanks for your Wine Wear post! Make sure to check out all our designs at www.winewear.com. We even have new designs coming in May.